The last few years are unusual due to the significant increase of investments on the Polish railway network. Also the amount of money spent on all the refurbishment works is record breaking. Numerous railway lines and station buildings are being refurbished all around the country. There are some 2500 station buildings in Poland at the moment that are managed by PKP S.A. Out of which only 600 serve passenger traffic. From 2010 a widespread modernisation program is being introduced by PKP S.A. supported both by state funds and EU grants. 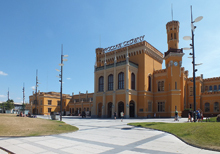 Approximately 1 billion zlotys was spent on the refurbishment of railway stations in the period of 2013-2015. The article includes a list stations that have been refurbished in the recent years divided by regions. 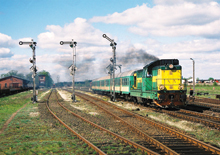 Another article from a series describing locomotive classes that disappear from the Polish railway lines is related to the current state of the Romanian built SP32 diesels – the last diesel locomotives purchased by PKP. The exceptionally low reliability and a mixture of unfavourable conditions related to their operation have all lead to the fact that these comparatively modern vehicles shared the fate of much older locomotive classes and just like them are now on the verge of extinction. After not much longer than 20 years from the delivery of the last such loco to Poland already 90% of the fleet has already been withdrawn. Currently only three machines can be seen in timetabled service: SP32-202, -204, -206, however their duties are connected with operating passenger trains on the Krzyż – Piła – Chojnice line only in case of a failure of on of the railacrs that serve the line on the daily basis. 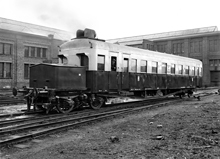 After regaining of independence by the Polish state in 1918 the Polish State Railways inherited 6 steam railcars after the railway companies of the countries that once partitioned Poland – 5 built by Komarek and a Belgian one. Only 3 were reintroduced and used on the lightly-graded lines from Skarżysko to Ostrowiec Świętokrzyski, Radom and to Końskie. In the following years railways had to face the road competition decided to introduce more steam railcars, as these were cheaper in operation than locomotive hauled trains. In 1928 one British-built Clayton steam railcar was bought for DOKP Kraków. In 1929 the Zakłady Mechaniczne Lilpop, Rau i Loewenstein in Warsaw purchased technical documentation and mechanical parts from the British firm of Sentinel-Camel Ltd., which allowed for another railcar to be constructed. Good experiences from the operation of the Clayton railcar on the Tarnów – Szczucin local railway lead to PKP ordering further 9 such railcars from Zakłady Mechaniczne H. Cegielskiego in Poznań. Narrow gauge steam railcars were also used on the Chybie-Strumień local railway in Silesia as well as on the Sochaczew County Railway. When describing new models presented on the Nuremberg model exhibition in 2011 we mentioned that L.S.Models announced the introduction of the models of PKP IC sleeping cars used in the EN „Jan Kiepura”. Early in 2014 these models were delivered to model shops all around Europe and proved a bestseller. More are to be produced in June 2014. The high demand for these models means that in this issue we are paying closer attention to the history of this unusual train, the carriages used in it and the possibility to recreate the train consist from the carriages offered by L.S.Models and other model railway manufacturers. The importance and uniqueness of the train are underlined by its characteristic dark blue livery with a light grey stripe below the windows with a stylized “EN Jan Kiepura” lettering on it. in Polish, size 210 x 280mm, 108 colour pages, 1 fold-out colour drawing of a Clayton-Cegielski steam railcar.